There are thousands of online pharmacies that offer international prescription services and to find a reliable one can be a difficult task for the patients. Northdrugmart.com is an online prescription service that offers medications and mail order drugs for patients throughout the world. The prime goal of the company is to offer quality medications through their network of contracted pharmacies. All these contracted international dispensaries are controlled by the authorities in their respective jurisdiction and meets the need of every patient. The company uses a secure socket layers or SSL encryption technology to safeguard the personal information sent by the buyers. 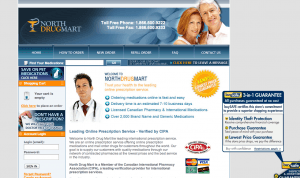 Northdrugmart.com is an active member of CIPA, a leading verification provider for online prescription services. But again on the other hand the company comes under the list of “not recommended sites” in NABP and this reveals the fact that any medicine brought from this company can put you and your family into risk. According to Legitscript the company is an unapproved internet pharmacy and since it dispenses drugs from sources that are outside of Canada, it may not be approved for sale either in Canada or in the US. We have also through another warning from Health Canada about the potential dangers of buying prescription drugs from northdrugmart.com. The review stated negative facts that the drugs for sale on these websites are not authorized for sale in Canada and the medications contain references to brand names that are authorized for sale in Canada. This leads the buyers to believe that they are purchasing drugs that are safe and of high quality. Scamadviser has also revealed that northdrugmart.com has a trust score of 0% and is not safe for any investments. Thus it can be concluded that it is better to judge the website for authenticity or search for a more reliable platform in case if you are planning to buy drugs online. Dealpharmarx.com Reviews – Scam Company with Shadily Low Prices! 2 years ago | No Comments on Dealpharmarx.com Reviews – Scam Company with Shadily Low Prices!